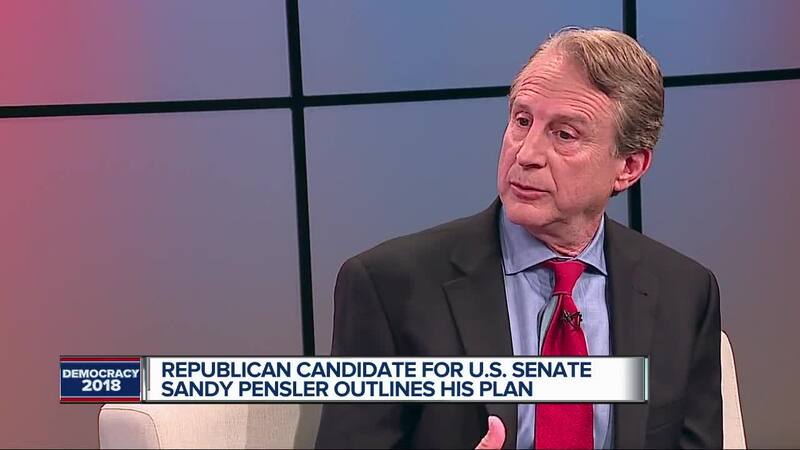 We spoke with Sandy Pensler, a Republican candidate for US Senate. A: I grew up in Detroit. I love playing basketball growing up, so I still shoot around a little bit with my kids. I try to play tennis with them, but they beat me so badly that that’s becoming a little bit less and less. We have jet skis, so we love going out on the jet skis on the lake during the summer. I like going out hiking and fishing and really love the outdoors here. A: Well I think the biggest thing we have to do is listen. In almost all of the school shootings, there were forecast in advance, whether it was on social media, whether it was students complaining that this person, whoever it was, was a problem. And I think we have to listen on those things and act on them more when there are realistic threats. And I think if we do that we’ll solve most of the problems. I think there’s some mental health things that we can look at, but I don't think the answer is just taking away people’s guns. I don’t think that’s going to be helpful in solving this problem. A: I think the president has the right idea in general which is we can't afford this huge influx primarily from our southern border. It cost about 250,000 net according to the presidents 18 budget for every illegal immigrant that comes over. I’m all for helping people in Nicaragua, Honduras, Guatemala, but I’d prefer to help the people in Michigan first. I think those funds have to be used here to help the people in Detroit, Muskegon, Grand Rapids, and we just have to be smart about it. We can expand skilled workers. H1B’s, guest workers who go home, and EB5’s who come over and have entrepreneurial things, but we’ve got to keep immigration. We’ve got to build a wall to stop illegal immigration from coming from the South, and we should end the diversity lottery program. A: We need a senator, and I’ll be that senator, who puts the interest of Michiganders first. Who understands the economy and how to drive and create jobs here in Michigan, so that we’re first again as we were in manufacturing, cereals, retailing, pharmaceutical. We fell behind. We’ve been making a comeback, but we’ve got to keep driving. And we’ve got to get help from the Senate, not just resistance which is what we’ve had. A: I think we need to fix the healthcare system. First of all, we have to completely repeal Obamacare, ACA, whatever you want to call it, and we have to put market mechanisms in place. There are a whole array of market mechanisms. We have to get rid of the crazy malpractice system not just because of the awards that are out of control but because it drives defense of medicine. We’ve got to get prescription drug cost down and instead of subsidizing the world, be competitive on prescription drugs. And we have to have fundamentally, incentives in the system for people if you are a consumer to shop and be sensitive to price, and if you’re a supplier, to compete and use price. The way the system is set up now we really don't do that. A: Washington is a bit dysfunctional. So it's on both sides of the aisle its not just Democrats, it’s democrats and republicans. I was in Washington when they passed the omnibus budget resolution. And I said ‘Really? We’re going to have more deficit spending?’ We just did a tax bill that’s rocket fuel on a hot economy, but it was a generational opportunity, but this more spending, it’s crazy. So I want to look at every program on the basis of: is it worth borrowing from our kids and grandkids? And if it’s not, which most of them won't be, then we’ve got to cut it out, because that’s a challenge. Because anytime you take away something, someone who has been using it is hurt, but does it pass that test? Is it worth borrowing from our kids to do it and I think most programs won't pass that test. Q: An opponent of yours is using an ad with video to suggest you did not support then-candidate Donald Trump. A: Ah it’s a clip job. They took video out of context. I was complementing the president on speaking as I believe he does simply and succinctly. He boils down very complex issues into simple language. And if you had heard the whole clip, it was very complimentary of the president. So it is sort of this typically gotcha politics.